The Zimbabwe Human Rights NGO Forum has today (the 11th of October) received reports on the arrest of over forty-five (45) Zimbabwe Congress of Trade Union (ZCTU) members in Harare, Mutare, Masvingo and Gweru to deter them from proceeding with the peaceful protest against government’s disastrous fiscal and monetary policies. 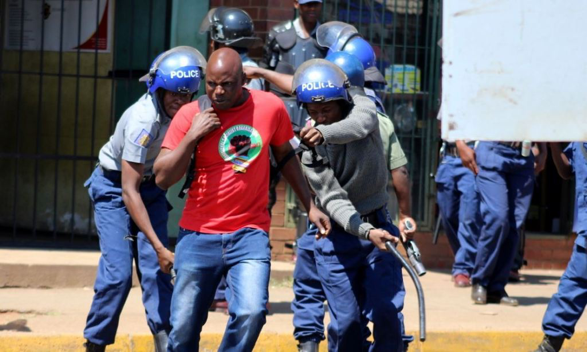 The ZCTU Harare Organising Secretary, Daniel Mboko confirmed in a telephone interview that 7 ZCTU staff members were arrested in Harare including the ZCTU President Peter Mutasa and their Secretary General, Japhet Moyo. ZCTU staff members were apprehended at their offices and detained at Harare Central Police Station. The ZCTU Legal Advisor, Mr. Mutimutema is reportedly under siege at the ZCTU offices with twenty (20) police officers reportedly guarding the entrance. Approximately twenty-two (22) ZCTU members in Gweru and twenty (20) in Mutare have been arrested. In Masvingo, ZRP officers reportedly arrested the Regional Officer for Zimbabwe Security Guard Union (ZUGA), Kevin Mawoyo and several others from their offices and detained them at Masvingo Central Police Station. In response to the arrests, the Zimbabwe Human Rights NGO Forum (the Forum)’s member organisation, Zimbabwe Lawyers for Human Rights (ZLHR) has deployed lawyers to offer emergency legal support services to the ZCTU members arrested in Harare, Mutare and Masvingo. Meanwhile, Harare Magistrate Lanzini Ncube is presiding over the hearing on an application filed by ZLHR lawyer Noble Chinhanu on Wednesday 10 October 2018 seeking an order to overturn the ZRP ban of ZCTU’s anti-government protest. The Forum will continue monitoring and updating you with the developments.